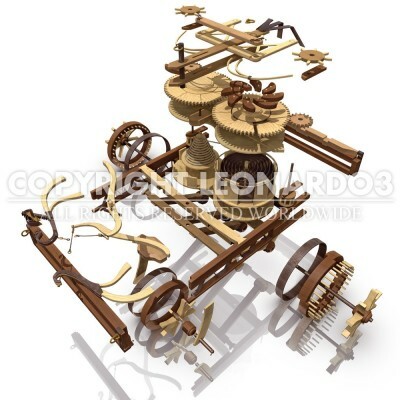 The famous drawing that presents the Self-Propelling Cart is actually a complex system for an automaton that can move by itself, used to create a theatrical stage effect. The system is spring-propelled; the leaf springs are auxiliary systems and the small pegged wheels at the bottom represent the escapement system. The details drawn around the central figure are studies on the braking and anchoring systems of the auxiliary parts. 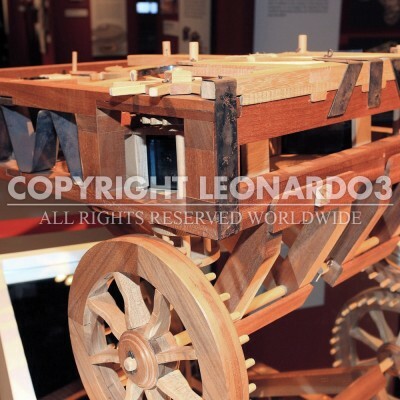 Despite the many interpretations of this machine made by Leonardo scholars throughout the 20th century, a definitive solution for the design has yet to be reached. That proposed in the 2004 interpretation (by Taddei and Zanon in collaboration with the Institute and Museum of the History of Science in Florence) concluded with the theory that this design is a self-propelling cart used for theatrical stage effects and not a means for transporting people or things.